This posting is a link to the various pieces this blog will publish in regard to the folklore of aquatic beasts in Loch Ness and other Scottish lochs. That Loch Ness had a tradition of such beasts is not in doubt. In fact, quite a few had such stories ranging from mere lochans only hundreds of feet across to the mightiest bodies of water such as Loch Ness itself. Such stories follow common themes though there would also be local variations. However, by and large, such stories were confined to the Highlands of Scotland where the preponderance of lochs would lie. Three beasts dominate our thread of posts and that is the Water Horse, Water Bull and the Kelpie. The three are similar but sufficiently different to merit their own stories (though this did not stop writers from confusing them). 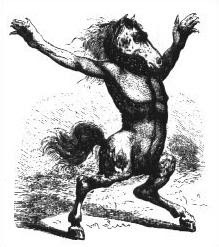 But their major differences would be that the Kelpie inhabited rivers whilst the Water Horse was seen as a more aggressive beast than the Water Bull. In the local Gaelic tongue their names would be Each Uisge (pronounced "ech ooshk") for the Water Horse and Tarbh Uisge (pronounced "tarv ooshk") for the Water Bull. No doubt there may have been dialectical variations to these pronunciations (I have seen "ooshkya" instead of "ooshk"). Unlike most cryptozoologists who regard such stories as mythical and unconnected with modern lake monster sightings, this blog takes the opposite view that there is a catalyst for this genre of story that was sightings of strange creatures. That is a theme that will hopefully be developed as time goes on but here are the relevant links below. Any strange or interesting tales from the pre-Nessie era which do not necessarily mention such beasts will also be linked here.